An interesting quote from Akrich, M. (1992). The De-Scription of Technical Objects. In W. Bijker and J. Law (Eds.) Shaping Technology, Building Society: Studies in Sociotechnical Change. Cambridge, Mass, MIT Press: 205-224. Why do I blog this? The paper describes how users' attributes are inscribed into technical objects in a study of third world electrification, and which, as a result, stabilize a sociotechnical network. 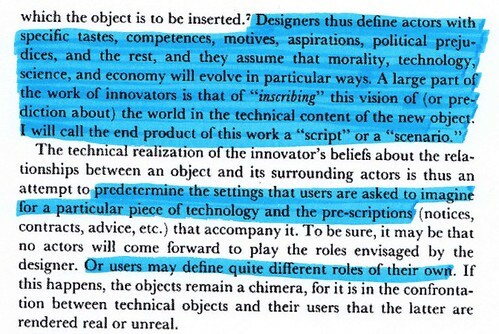 The notion of script is described, something quite relevant for a current research project.